Palm Springs Life has partnered with the homeowner to unveil The Forgotten Frey during MODERNISM WEEK, FEBRUARY 14‒24, 2019. INTERIOR PRESERVATION AND RESTORATION: The homeowner has taken great care in preserving and restoring the interior and exterior areas of the home to original 1955 condition. The kitchen appliances and countertops, bathroom fixtures, tilework, and windows remain intact. Extensive research has been devoted to locating authentic replacements for a few items that were beyond repair, while others are still in progress. Some that are still needed are replacements for cracked asbestos tile, wall-to-wall carpet, accordion folding doors in the pass through area of the kitchen, draperies, period correct furniture and accessories, and landscaping. Nicholas Lawrence Interior Design will furnish the home mostly with Knoll Furniture, along with other vintage objects to create a faithfully-curated design for ticketed touring during Modernism Week, February 14‒24, 2019. The home unveils during MODERNISM WEEK, FEBRUARY 14‒24, 2019, providing tour goers the opportunity to be among the first to view the interior preservation and restoration. 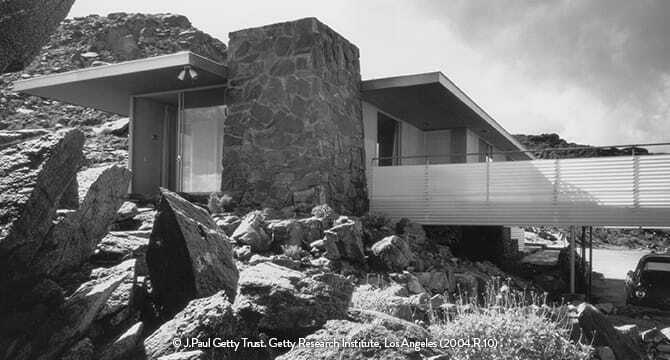 Do you want to learn more about the house and architect Albert Frey? 3737 E Palm Canyon Dr. This dwelling has exterior or exterior steps and is not handicap accessible. Please plan to arrive 20 minutes before your tour’s scheduled start time to allow for parking and transportation. Please follow signage within Porsche of Palm Springs for directions on where to park. Shuttles will be provided to transport guests to and from the home. Tickets will be checked before boarding the shuttle. Current ticket holders should contact info@modernismweek.com regarding exchanges. For more information or to receive tour updates – sign up for our mailing list today.